When I started to document the colleges in Europe with English-taught degree programs, I realized that there were many terms and concepts I needed to understand before I could delve in too deeply. Though it’s not especially exciting information, exploring possibilities for studying in Europe can be overwhelming without knowledge on these topics. Below is some of the information you need to know before you start this journey. Things have changed a lot in European higher education in the past couple of decades. In 1999, the Bologna declaration was signed by Education Ministers from 29 European countries. The purpose of the declaration was to create a European Higher Education Area with comparable and understandable degrees and credits across its member states. This enabled greater mobility for students in the EU. Degrees across the participating countries coordinated the duration and structure of degrees which makes learning outcomes consistent and helps with quality control. There are now 47 participating countries. This is also helpful to US students who get their bachelors in Europe, but want to get their masters in the US. Their qualifications and education are much more understandable to the admissions officers in the US than in the past. One creation of the Bologna Process, was that of the European Credit Transfer and Accumulation System, which is a standardized system of cumulative and transferable credits across the EU. These are basically like credit hours. In the US, credit hours are usually put in terms of classroom hours (the 12 hours of credit a student gets in a semester means that they had 12 hours of time in class). ECTS hours are an estimate of the total amount of time the student is expected to put into the class (including classroom hours, reading, group work, studying for exams, etc). One full time academic year is 60 ECTS and, depending on the school and program, it takes 180-240 ECTS to receive a bachelors (which you might also see referred to as first cycle). Full time students are generally in class for 10-12 hours per week, with an additional 30 hours of study expectations outside of the classroom. Universities are academic and research based. They can award bachelors, masters, and doctorate degrees. They are similar to universities in the US in that students are focused on research, learn to be analytical, and to present arguments (as opposed to preparing for a vocation). Many university students go straight to a master’s degree program. University of Applied Sciences offer a practical higher vocational education for a specific profession. There is more of an emphasis on learning through application than through research. Internships are generally required in these programs, as the focus at UAS schools is to provide students with the skills, knowledge, and competencies needed for the professional world. You are likely to see degrees in Business, Engineering, Digital Arts, Computer Science at University of Applied Sciences (and at Universities, as there is some overlap). You are not likely to see UAS programs in the Humanities or Natural Sciences, as both generally require a higher degree before entering the field. I think this is a really cool concept as career preparedness seems to really lack in the US schools. Students can still go on for a master’s degree, but usually need semester or so of required courses to do so. Then there are University Colleges. In the Netherlands, the University Colleges offer an honors level liberal arts degree. They are part of a university, but classes, living, clubs and such are self-contained. There are additional admission requirements as well as requirements for living on campus (1-3 years depending on the school). Belgium also has University Colleges, but they are not liberal arts programs. In Belgium, the University College is affiliated with the university but not part of the university like in the Netherlands. The main difference between in Belgium is that University Colleges in Belgium do not offer doctorate degrees. When you apply to college in the US, you are generally applying to the school and sometimes can state a major when you apply. 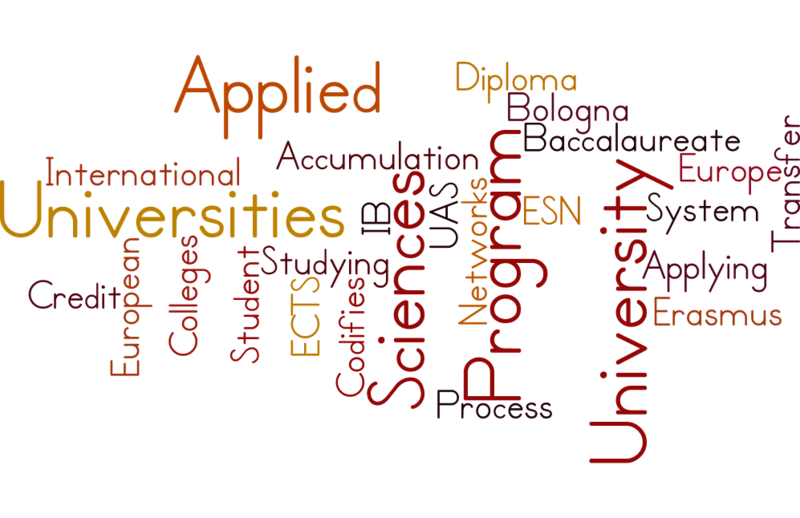 Generally speaking, in Europe you are applying to a specific program at a school. Some students might find this overwhelming, but it is not much different than the process of declaring a major. You will find that you have programs that cover fairly from the broad categories. Examples would include, Business Administration, Information Technology, Environment and Energy, Philosophy, International Relations, and many more. Then you will find some programs that are more specific and/or a combination of more than one study field. Examples are Sustainable Use of Natural Resources, Business Information Technology, Luxury Goods Management, International Wine Business. There is also a program that is called Economics, Politics and Social Thought and another which combines Humanities and Social Sciences (Humanities, Society and Culture). I think the options are super exciting, but if you are more of a traditionalist, there are an abundance of liberal arts program choices as well. The Erasmus Student Network is the biggest student association in Europe. On each campus, these are student run organizations for international students that organize cultural, information, and social events. They organize parties (LOTS of parties) and trips as well. Activities may include pub crawls, yoga, acclimation programs for new students (including tandem language learning), weekend trips, trips during breaks, international dinners. And did I mention lots of parties? Before admitting a student, schools want to know that the high school education the applicant had is equivalent to the ones students receive in that country. The different countries and schools have different requirements for applicants from various countries. For instance, students who are graduating with a regular US high school diploma must also have at least 3 AP courses with scores of at least 3 in Italy, Norway, the Netherlands, Denmark, and for some schools in Switzerland. In Lithuania and Germany, US students don’t need the AP courses, but must submit SAT or ACT scores. Private schools across the EU may or may not require AP classes or test scores for US students, depending on the school and program. IB diplomas-and why you are lucky if you have one! Good news for students graduating with an IB diploma-you get to bypass all these extra requirements! The specific requirements needed for an IB diploma allow students to apply to college in Europe with automatic equivalency. One less hoop to jump through! BSA is a common practice at schools in the Netherlands and can be found at other some other schools in the EU as well (though it may have a different name). Each school has different requirements about how many classes students must pass each year. At the end of the first year, a student’s academic progress is evaluated and a decision is made by the school as to whether or not the student can continue her studies the following year. Many schools offer a non-binding evaluation after the first semester before the binding decision is made at the end of the year which can serve as a warning for students who aren’t on track. I need to get more informations about how to go Study in Europe. Iam a United States Citizen. We have lots of free content here on our site. If you’d like more personalized help, check our our Services page for the various options. I’m an Ecuadorian citizen and I’d like to know more about my options since I do not live in the U.S .Nevertheless I do have proficiency in the English Language. Am I a good candidate ? You may be a good candidate. Non native English speakers will need to pass an English proficiency test to be accepted into the program. If you’d like to keep up to date on what we’re doing, the best way is to sign up for our newsletter. I am curious to know how you recruit students to your website / program / schools? Do you do speaking engagements at High Schools? Do you have a travel schedule? How do I know when you will be at my children’s high school? We live in Chicago. Thank you. In the future, we could hold onsite meetings with parents at schools. Our initial approach is to build an online community of people who are interested and passionate about college in Europe. I recommend you check out the resources on our site and sign up for our newsletter, where we will provide useful information.